for making it possible to have our monthly programs video-conferenced across The Big Sky! 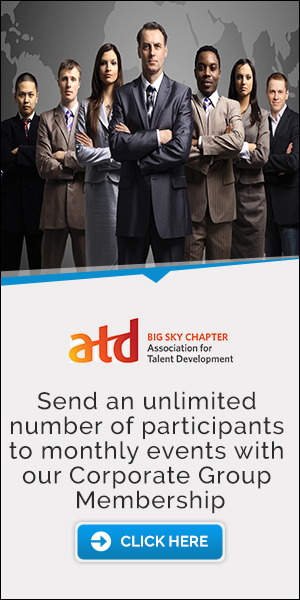 The Big Sky ATD Board is very excited to let you know that our chapter has won two distinct awards from our National ATD Board. 100% CARE and Membership Super Star Status! Joint Membership Reward for 2016: As part of the 2015-2016 CARE pilot program, the Partnership Team, a task force consisting of ATD staff, National Advisors for Chapters, and leaders from diverse chapters of different sizes, geographies, and joint membership achievement levels, established a new rewards program to recognize the top three chapters in each size category for the highest percentage of joint membership for the year. With a joint membership of 78%, your chapter is awarded first place in your size category! Thank you for being a valuable asset to our Chapter. We appreciate you all for your contributions. Mission: To promote Talent Development by connecting regional professionals to transform ourselves, our workplace, and our communities. All information ©2017 Big Sky ATD.